So your organization wants to have the ability to create ID cards in-house, and you’ve been assigned to find the best ID card printer. 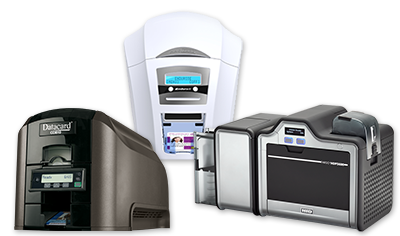 What’s the best ID card printer available? The short answer: there isn’t a “best” printer. Sorry! While there isn’t a one-size-fits-all ID card printer, there’s definitely a printer that’s ideal for your specific printing requirements. But how do you know which one is right for you? It’s easier than you might think because we offer a variety of helpful tools that will allow you to become an informed and confident ID card printer shopper! 1. How much information will cards display? If you’re only including a limited amount of information on your ID cards – like name, photo, and company logo – single-sided printers are the way to go. If you need to print more information than the basics (e.g., employee ID number, barcode, cardholder title, department, etc. ), dual-sided printers are the optimal choice. 2. What about data storage on your cards? You’ll want to choose a printer with encoding capabilities which allows you to add important information – like cardholder details or access privileges – onto a card’s magnetic stripe or directly onto technology cards like smart cards or proximity cards. 3. What type of card will you be printing to? This is critical because the type of card you use dictates which printing technology that’s best for you. Retransfer printers are the logical choice as they use special technology for printing on cards with uneven surfaces like proximity cards or smart cards. For printing on basic plastic cards, direct-to-card printers make the most sense, but retransfer printers can also be used for outstanding visual quality and durability. 4. How durable do your cards need to be? If your cards will be swiped through a magnetic stripe reader or be worn outside for extended periods of time, you’ll want to invest in a laminating card printer. Laminating printers add a clear, thin layer to the surface during the printing process that protects cards from fading and also extends the life of cards. 5. Where will your printer be located? All printers include a USB port for convenient printing in any office space. If you plan on operating your printer on a network, choose one that offers Ethernet connectivity. For mobile connectivity (e.g., if you’re traveling between offices with your printer), a number of printers offer a Wi-Fi connectivity option. If ID card printing is completely new territory for you, our Learning Center is a smart place to start. Because there are many things that factor into finding a printer that’s right for your unique needs, we provide a wide variety of helpful and informative articles and videos to give you an overview of the important basics. Watch Our Videos & Learn! We’ve assembled a collection of short videos to help you learn more about ID card printing. They range from choosing a printer to an introduction on a number of printer features and advanced printing capabilities to how to make ID cards and more. The first step to finding the “best ID card printer” is defining what your organization’s specific card needs are. Once those parameters are set, the rest is actually fairly simple, especially since ID Wholesaler offers all of the necessary resources and tools to help get you started! Call us today at (800) 321-4405.